The English wedding tradition for “something blue” dates back to the 1890s. More than 100 years later, the tradition still stands and is loved by brides. If you’re still searching for your “something blue”, you’ll adore the Zora clutch by Nina. Zora3 Clutch in Seagreen Multi Crystal, More Colors Available $58. The clutch is covered in crystal embellishments on the front and finished with silver colored hardware. It also has an interior pocket for your smaller wedding essentials, plus a pretty 44″ flat curb chain for when you want to hang it over your should. For the closure it’s our favorite, the elegant magnetic snap. What’s not to love? Other than being the perfect size at 9.5″ X 5″ X 1″, it’s covered in a beautiful material on the back, making the clutch have all the elegance you need for a special day. It’ the perfect ‘something blue’ for the bride whose wedding gown is anything but simple. 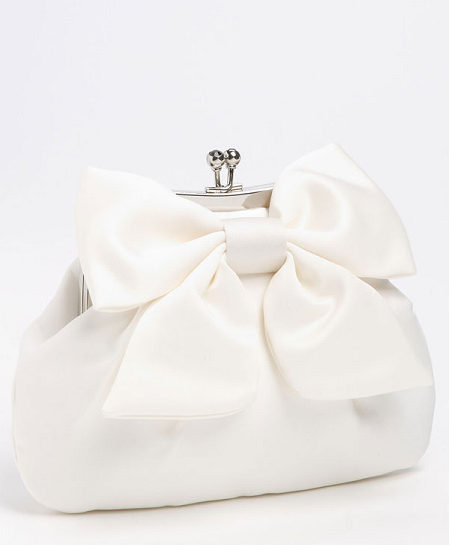 Is This Your Bridal Clutch?